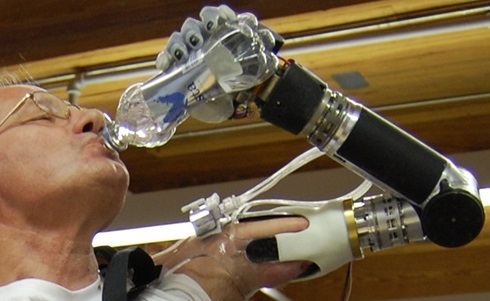 Robotic Arm Prosthesis Developed by DEKA Research and Development Corp.
Robotic arm prosthesis. Fondly known as Luke, named after Luke Skywalker, this popular robotic arm was funded by the Defense Advanced Research Projects Agency (DARPA) and the U.S. Army Research Office is seeking for more research and development to help people restore their functionality, especially for those who have suffered upper extremity amputations. The DEKA robot arm was conceived way back in 2007 when the Defense Advanced Research Projects Agency (DARPA) appropriated $18.1 million for the projected. DEKA was awarded the contract and had set out to design and fabricate “an advanced prosthetic arm and hand” within two years. The company employed only the most prominent name in the industry, as well as used only the most state of the art technologies in existence to date. DEKA’s Integrated Solutions Division also worked with the country’s topnotch medical researchers at the Rehabilitation Institute of Chicago who was widely recognized for designing and developing surgically attached thought-controlled prosthetic arms and hands. DEKA designers and engineers had started the so-called Neuro-controlled Bionic Arm pioneered at the Rehabilitation Institute of Chicago (RIC) by Todd Kuiken and a team of researchers. Kuiken, director of RIC’s neural engineering center for artificial limbs, thought of a unique idea of assembling existing nerves in the amputee’s upper limb to bands of muscles connected to into the chest. This will function as acting controllers which will aid the movement of the artificial limb. After the replanted nerves were innervated on the chest muscles, the amputated or paralyzed patient will have to think about the arm and hand movements. The result is a contracted muscle that will move according to what the individual is thinking of. A myoelectric sensor detects the contractions, telling the amplifier and digital signal processor to sends command signals that will compel the artificial arm and hand to move. A commercial version named the Boston Digital Arm which was already commercialized by the Learning Technologies, Inc. of Holliston, Ma, has also helped DEKA make a milestone achievement with the prosthetic arm effort. Aside from DEKA, researchers at Northwestern University also helped in the project. The university has its prosthetics research in the RIC facilities. The Canadian researchers at the Institute of Biomedical Engineering at the University of New Brunswick also helped in the work. They have already helped develop the EMG pattern recognition algorithms for Kuiken’s bionic arm and at the time of the project, the team was also foregoing developing sensors directly linked to neurons. A breakthrough came in May 2012 when two people who were previously having inability to move their limbs were finally able to do so with the help of the robotic arm prosthesis.to reach and hold objects using only their brain activity. The milestone was well recorded by the Nature magazine, one using the DEKA robot arm, the other using the robot arm designed and developed by the German Aerospace Center (DLR). Read more about the Deka arm.